The dissatisfying situation at German Universities for already established professors as well as academic hopefuls is well-known for years. However, the common overload of teaching, lack of resources and time for research, an inflexible administration, lack of transparency in appeals procedures, even nepotism, has hardly been discussed openly by the persons concerned. In a recent article in the (no longer so glossy) monthly magazine, Forschung und Lehre 2008;15(7):464, of Deutscher Hochschulverband (a kind of union of German professors) a young German physicist and astronomer describes his experiences in Germany’s Academia where he had been employed in limited-term appointments with by and large insufficient social security for almost 20 years. It seems to be a typical University career with a high risk of getting unemployed in midlife when Germany won’t offer appropriate positions any more. One has to realize that in the Federal Republic of Germany responsibilities for governmental Universities belong to the ministries for Science and Culture. They are sovereign tasks of the Länder (counties), and professors are generally appointed by the federal state government. Thus, the Land has also to pay the pensions. Most of the Länder have therefore an age ceiling of, say, 52 years for new appointees since they simply don’t want to pay for the retirement. So, even in case of excellent qualification and the University’s preference the middle-aged scientist would not get the position he or she deserves. Looking for positions abroad is always feasible. I have actually decided about ten years ago to leave Academics in Germany and have found it very easy to get a proper position in an international and even exotic ambiance. It has dramatically broadened my horizon and provided completely new opportunities. My good advice for young colleagues without any chance of getting an appropriate position (which can only be the full professor) is browsing international advertisements, not only the national ones. I have met colleagues from, for instance, Scandinavia who are extremely flexible in taking positions abroad. For a couple of years or forever. Some of them may even fan out an aura of ingeniousness but that is not really a prerequisite for functioning and participating in academic environments abroad. In my experience, especially Scandinavians have never a problem to get the right and proper position. Why are Germans generally less flexible? German academic titles are usually difficult to comprehend by Scandinavians or Americans. The nonexistence of a PhD but rather strange denominations such as Privatdozent or Habilitation which are not automatically assigned to academic positions (a major reason for the here described calamity) cannot easily been elucidated. As an example, my Dr. med. dent. degree had been considered equivalent rather to a Master degree, while Privatdozent (no title) was regarded a PhD. The lack of intermediate positions in the German system, such as Assistant and Associate Professor, may further lead to an undesired downgrading of the applicant. It is in a way remarkable that complaints about this weird situation at German Universities, which is hardly understood in other European countries or in the United States, are reported by the concerned persons only very recently. Similarly, the massive strikes of physicists and nurses at University hospitals which have, in the meantime, frequently been passed into private hands, may come too late. Decades of a misrouted policy for Science and Education, the shameless exploitation of work force and intellectual property, when, at the same time, future prospects are withheld and risks of unemployment become unbearably high will finally lead to a further brain drain which a country with an aging population cannot afford. On the other hand, the one who decides to leave should be strongly encouraged. In contrast to popular beliefs is the world flat and almost unexplored. 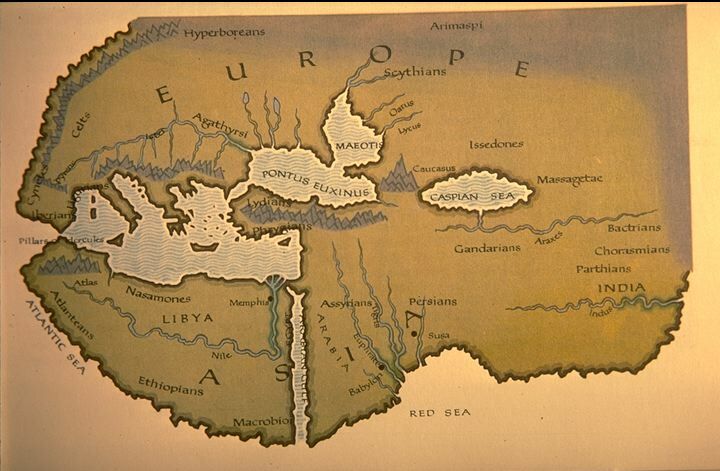 Note: While the limited knowledge about the World in Antiquity is represented on the above map, the curiousness and willingness to travel and learn during his whole life of the ‘Father of History’, Herodotus, again inspired me recently when reading Ryszard Kapuscinski’s wonderful book about his unequaled antetype. This entry was posted in Academics, Germany and tagged Academics, Germany, University. Bookmark the permalink.